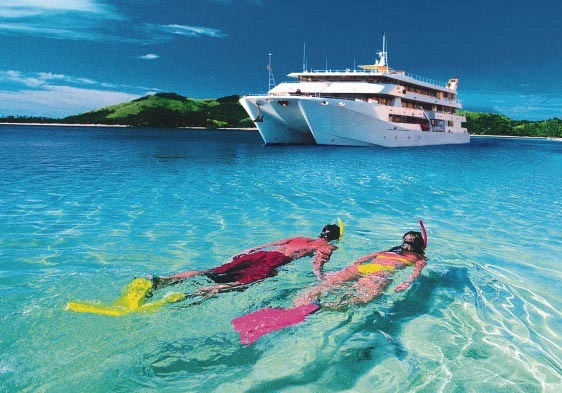 Blue Lagoon Cruises has re-launched itself with exciting new 3, 4 and 7 night itineraries and many other product developments on board its boutique cruise ship ‘Fiji Princess’. The itineraries have been considerably enhanced to provide guests with many more daily activities, unique Fijian cultural experiences, interaction with local island villages and great evening entertainment. Exciting options like swimming with Manta Rays, fire dancing, cave visits, a night at Tom Hanks’ “Castaway” island, diving and private island beaches are just a few of the new inclusions. Executive Director of Blue Lagoon Cruises, Chris Jacobs said these were some of the most exciting changes seen in the 60 year history of Blue Lagoon Cruises. “We are taking what is already an iconic tourism brand and making it even better,” Mr Jacobs said. “We are moving toward a higher end delivery of service, dining and experiences that will delight guests who cruise with us,” he said. Blue Lagoon Cruises now depart from Port Denerau Marina which, with its shops and restaurants it is a much better departure experience. Guests can also combine an island resort stay in the Yasawas or the Mamanuca Islands with a cruise and have the best of both worlds – cruising through the islands and visiting deserted islands, as well as staying at an island resort. The 60m (179 foot) MV Fiji Princess catamaran has 34 deluxe air conditioned and ensuited cabins, all above the waterline with large windows and ocean views – ones that change daily! In line with the new itineraries, a new minimum age policy has been introduced, with cruises now only taking guests 14 years and older*. “The changes that we’ve made at Blue Lagoon Cruises allow us to better cater for couples and honeymooners, as well as offer an intimate, boutique cruising experience for people who may not have been on a cruise before or who are looking for something a little more private than a large ocean going cruise ship,” Mr Jacobs said. Charters for business groups, weddings or other special occasions are also available, with customised itineraries designed around the needs of the group.